What can I say about braised chicken other then Yassssssss, I'm sure most people will think that braising chicken is a hard Feat but don't fret. First things first, whats Braising? 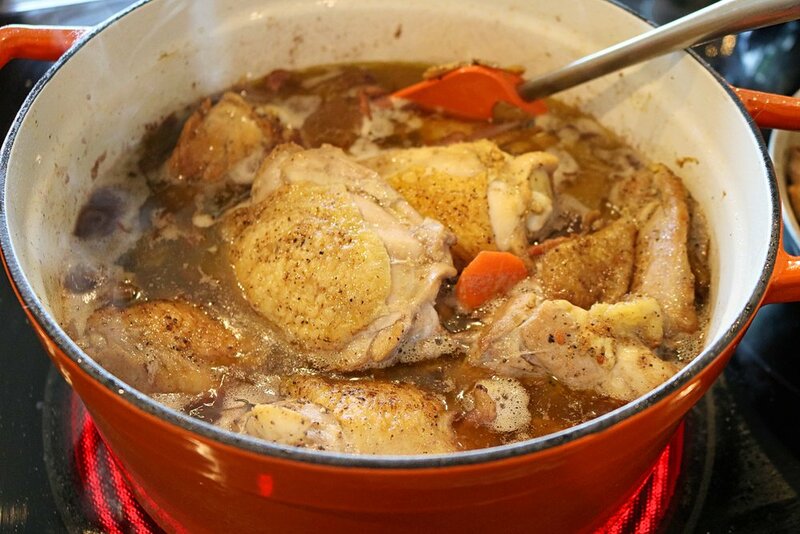 Braising is a combination cooking method including both dry and wet heats, from searing off the chicken to then adding a liquid to your dutch oven and closing that lid off, allowing it to cook in the oven until done. This super simple recipe is straight to the point and packed full of flavor. I start off by rendering bacon and reserving all that good oil in the dutch oven to solidify a base of flavor for the rest of the dish. Were all about building the flavor to its fullest capabilities, from there we add our chicken thighs, I use chicken thighs mostly because you really can't go wrong with it. Its juicy, flavorful and plays well with others so heres to what I think is the perfect piece of Protein. Remember not to over crowd your dutch oven so that we are Searing and not Steaming!!! Once seared on both sides we remove the chicken and add our carrots and onions and allow those to brown off a bit and then we add garlic to the party, of course we are seasoning as we go (building of flavor). Everything chopped up, but you can use this as an example. allow those to cook for about 10 minutes before you add your fresh garlic, remember to season with salt and pepper as well. After all the veggies are done having a good time we remove them and add our cognac to deglaze the pan. Add everything back in and by everything I mean everything, Chicken, bacon, thyme and all your veggies and whatever juices they released while chilling together. add your chicken stock, hopefully you were able to find a low sodium one. If not just adjust the seasoning but remember the salt you add in now will continue to cook down and progressively get stronger so we use Low sodium so we have some control over the final taste. seal your dutch oven and place that bad boy in a preheated oven at 250 degrees for 30 mins. once the timer goes off we remove the pan from the Oven, now we will be thickening it to give it that certain mhmm factor. Place the Dutch oven back on the stovetop at med heat and use your butter/flour mixture (Beurre Manie- room temp butter and flour mixed well together) bring that up to a boil and watch it thicken. Taste your sauce if its missing some salt add it in now and I served this over a bowl of quinoa but you can eat it as is with all those veggies and chicken. Bring a dutch oven up to med low on your cook top and add your bacon to that cold pan and allow them to come up to temp together while drawing out the bacon fat slowly, once cooked off reserve about 3 tablespoons of fat in the dutch oven and keep your bacon in a plate or bowl until its needed. Add a bit of the bacon fat if need be and add your veggies to the dutch oven and allow those to cook for about 10 mins and add your garlic, salt and pepper. 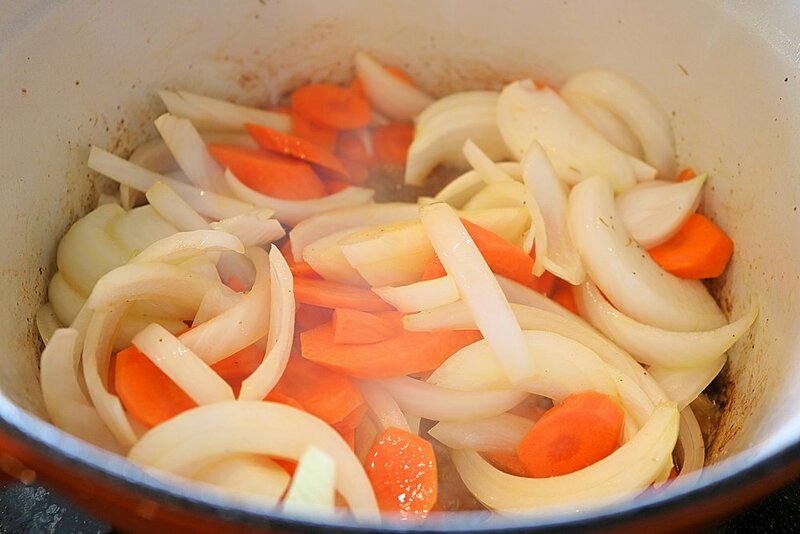 Add your chicken (including juices) bacon, veggies, thyme, chicken stock, 1/2 of the bottle of red wine and the bag of pearl onions, seal the dutch oven and place in the oven for 30 mins. Be careful removing from the oven and place that Dutch oven back on the stove top at Med Heat, make some space and add your butter flour mixture and bring it back up to a boil and watch your sauce thicken. Once you have it at the proper thickness (enough to coat the back of a spoon) taste and season accordingly with salt and pepper if its needed. I served mine over a bowl of quinoa but this can be a meal as is with the veggies and chicken.